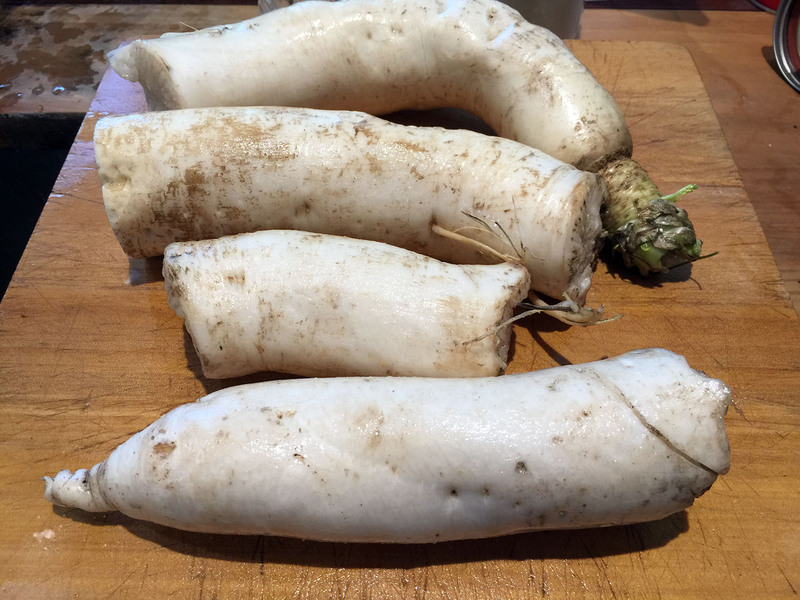 I’m very partial to daikon, the enormous white radish that’s much loved in Japan. It grows very fast, up to the size of my forearm, and it’s pretty pest resistant. That success is also the challenge: how to get through an arm-sized daikon with the two of us? My recent purchase of Preserving the Japanese Way provided a timely solution: dehydration. It’s not as crazy as it sounds! 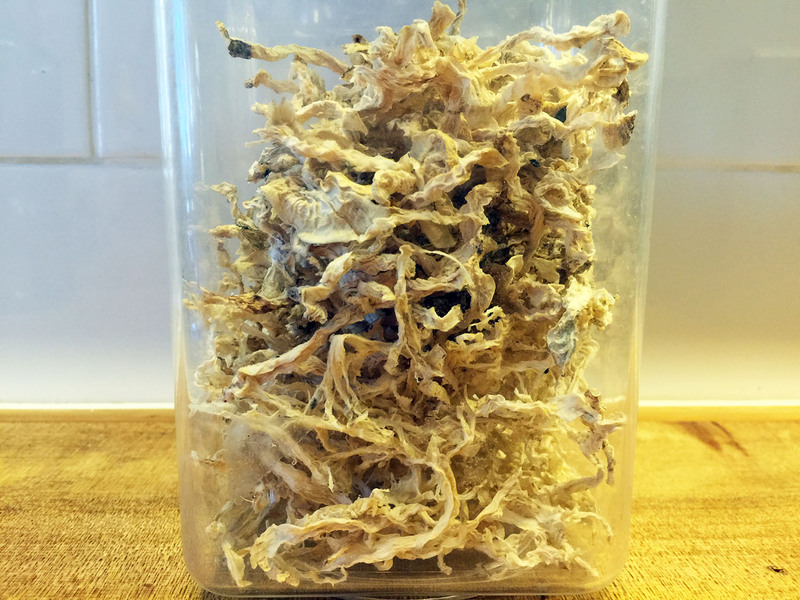 Plenty of other things are dehydrated (think apple, banana, etc), including Japanese ingredients like seaweed. A mandolin makes quick work of creating strips. The process is a simple one: use a mandolin to cut the daikon into thin strips. I tried two different sizes of strips, and the daikon was processed in under five minutes. After a day in the dehydrator, this is the result. 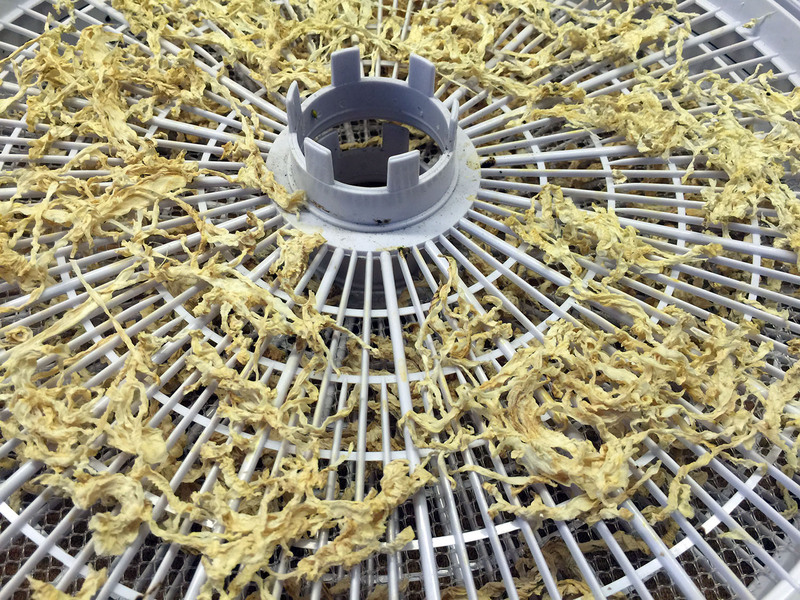 Then into the dehydrator it goes! Run it for a day at the medium setting, and the result is a tangle of dry strips. These can then be stored for many months. According to the cookbook, they need to be soaked for an hour or two before use. Stored in a jar in the pantry, this will last for many months. 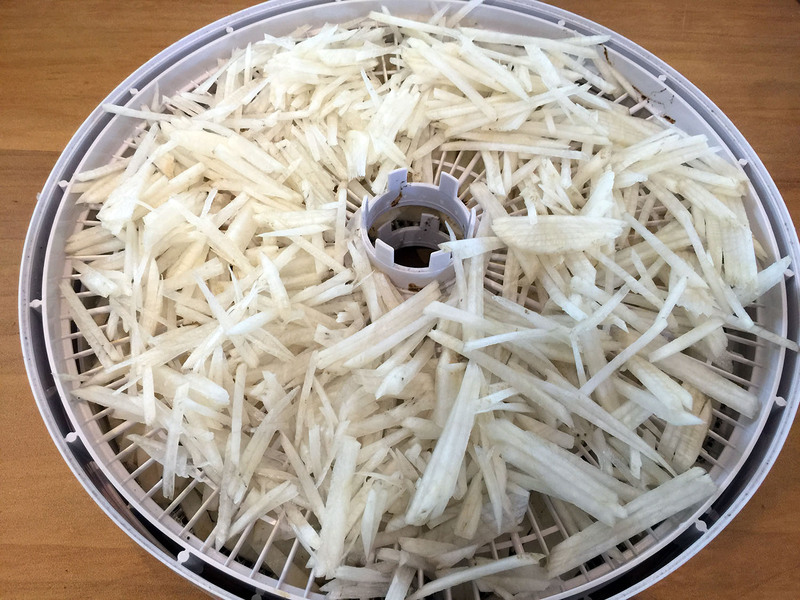 This entry was posted in Cooking, Growing our own food and tagged daikon, dehydrating, Japanese. These French breakfast radishes are super cute! Baby-sized and bright red, these are ready for the picking. They are also one of Miss P’s favourites. This entry was posted in Growing our own food and tagged beetroots, carrots, daikon, heirloom, leeks, onions, potatoes, radishes, shallots, spring onions, turnips, winter. Attack of the killer daikon! There’s something supernatural about daikon (Japanese white radish). They grow amazingly fast, and are immensely large when pulled out of the ground. They’re quick and easy to grow, and are hard to get in Australian supermarkets. I’d have to say that the first ones we picked were an acquired taste. Miss P didn’t warm to the surprisingly bitter flavour, so I had to hide them in soups and the like. I had read that they become milder in taste during winter, and thankfully this turned out to be the case. In a recently-acquired cookbook, I found a receipe for pickled daikon, so I gave that a go. It’s an absolute winner! Once pickled, the daikon takes on a very different flavour; sweet and fruity. Great as a side dish during a Japanese meal. We now have two jars of pickled daikon, with more plants still in the ground. This entry was posted in Growing our own food and tagged daikon, pickling, winter.